Purchase 4 or more 2019 Golf 4 Packs (16 rounds) and receive a free Indoor Golf Simulator Membership and pay no greens fee through February 28, 2019 just a $14 cart fee per 18-hole round. This offer will not last long so visit the following links for complete details or call us at 301-874-5400. Twenty years ago this Friday, May 18, 1998 we opened our front 9-holes. In celebration of this special day bring three friends to play golf and you’ll receive $20 off your round before 3 PM. After your round enjoy 4 beverages (IPA Beer, Rail Cocktail or Wine) for $20 at BAR19. 20 Years $20 Off promotion is only valid with 3 accompanied paid regular or senior rate 18-hole rounds with cart on Friday May 18, 2018. Not valid with other offers, promotions, discounts or member rounds. To receive discount please state promo “20 Years $20 Off” when registering and paying for your round of golf. $20 for 4 beverages promotion (IPA Beer, Rail Cocktail or Wine) is only available at BAR19. Please state “$20 for 4” promo to bartender or server to receive promotion. Ben Hogan shot a final round 70 to win the Bing Crosby Pro-Am tournament, earning $2,000.00. The event was a three day, 54-hole tournament played at Cypress Point Club, Monterey Country Club and the Pebble Beach Country Club in Monterey California. He earned an additional $500.00 for placing third in the Pro-Am best-ball competition teaming with Johnny Dawson of Los Angeles, the defending champions in the Pro-Am division. Flying Dog Brewery and Worthington Manor have teamed-up to offer Golftoberfest. Join us for a great day of Golf, Food, Beer & Prizes . The format is a 2 person team shamble and prizes will be awarded to low net and low gross scores along with a longest drive contest and two closest to the pin. Enjoy a round of golf Labor Day weekend on Sunday or Monday between 12-3 PM for only $59 or tee it up at 4 PM for just $49. Both offers include 18-hole greens fee, cart with GPS, range balls and applicable taxes. Plan to play Labor Day weekend on our smooth un-aerified greens! The above special rates are not valid with other offers, promotions, discounts, outings, groups, member rounds, ault-clark member rounds or multi-round packages. Enjoy a spectacular round of golf on Tuesday, May 30, 2017 and receive a free lunch from J.T.’s Grill. To receive free lunch please state promo code “Free Lunch” when paying for your round of golf. Senior 55+ receive the standard senior $10 off plus a free lunch! Offer Details: Free Lunch with round is good Tuesday, May 30, 2017. To receive offer please state promo code “Free Lunch” before paying for your round of golf. Offer is good with paid 18-hole round with cart before 3 PM and includes one menu item (includes all burgers except the J.T. Worthington burger) and fountain beverage. Promotion does not include food service gratuity and not valid with other offers, promotions, discounts, member rounds, ault-clark member rounds or multi-round package rounds. 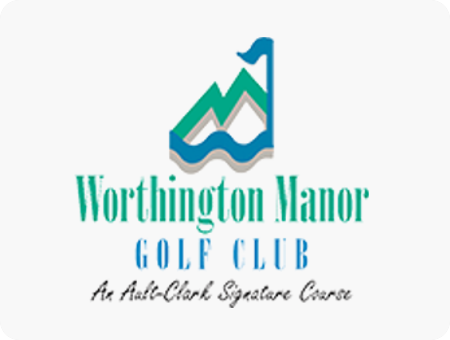 Play Worthington Manor Golf Club this Memorial Day weekend and receive a $20 e-gift card. To be eligible simply play an 18-hole round with cart between 12 and 3 pm on Saturday, Sunday or Monday and state promo code “Memorial Day Gift Card Special” when you pay for your round of golf. Seniors 55+ receive the standard senior discount of $10 off plus a $10 e-gift card. Offer Details: To be eligible to receive a $20 e-gift card you must purchase an 18-hole round with cart for a scheduled tee time between 12 and 3 pm on May 27-29, 2017. Offer is only good with our regular $79 rate between 12 and 3 pm and you must state promo code “Memorial Day Gift Card Special” when you pay for your round of golf. $10 or $20 e-gift card may be used for golf and food/beverage purchases only. They are not redeemable for golf shop merchandise. Seniors 55+ will receive the standard senior $10 off plus a $10 e-gift card. If our system does not have a senior profile set then you will receive a $20 e-gift card. Offer not valid with other promotions, discounts, member rounds, ault-clark member rounds or multi-round packages. Celebrate Cinco de Mayo on the golf course and don’t let the weather forecast discourage you because Worthington Manor Golf Club is declaring Friday through Sunday (May 5-7) Super Rain Check days. At any point if we receive a 1/10th of an inch or more during your round you will receive a Super Rain Check. A Super Rain Check is an 18-hole rain check regardless of the number of holes played, even if we receive 1/10th of an inch while you are on the 18th hole. Please visit our Super Rain Check page for complete details and restrictions.